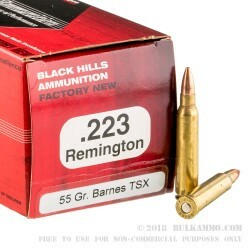 A multi-faceted round in the very broad market of the 55 grain .223 Remington cartridge arena, this Black Hills ammo with a Barnes TSX projectile offers incredible accuracy, high tolerance manufacturing procedures and an all copper bullet that can easily be used for hunting deer (check your state and local regulations first before using this round to hunt bigger game with). The all copper projectile offers excellent flight control; weight retention upon impact, meets most anti-lead requirements and is a very accurate projectile. Black Hills is a well-known producer of ammunition and components; perhaps even more interesting is the fact that Black Hills sells ammunition to every branch of the U.S. Military in a contract position. 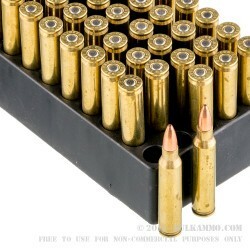 This means they know a thing or two about .223 and 5.56 ammo. 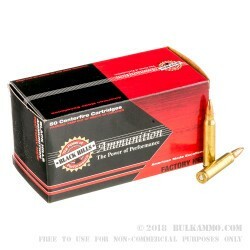 The choice for the all copper 55 grain TSX was the clear deer hunting benefits of the projectile; which is both a good thing and a bad thing for this ammunition. 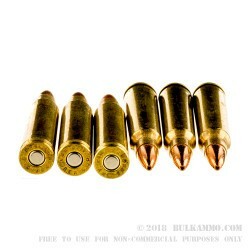 The huge expense of using an all copper bullet means that the ammunition is pricey, but the benefit of using the components they did, is that you get on target, stay on target and dispatch that target with ease.